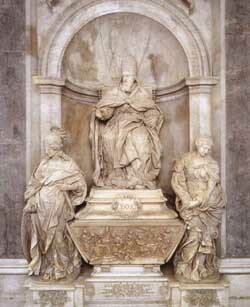 This white marble Monument to Leo XI is by Alessandro Algardi (1595-1654). 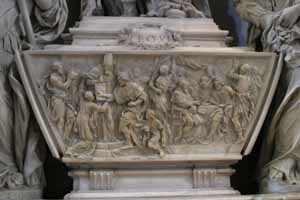 The roses carved on the plinth and the inscription "Sic florui", refer to the fact that he reigned only 27 days, in 1605. Beside him are two female allegories: Fortitude and Generosity. The scene below is the abjuration of Protestantism made by Henry IV of France when Leo was apostolic nuncio, and the signing of a peace treaty between Spain and France. 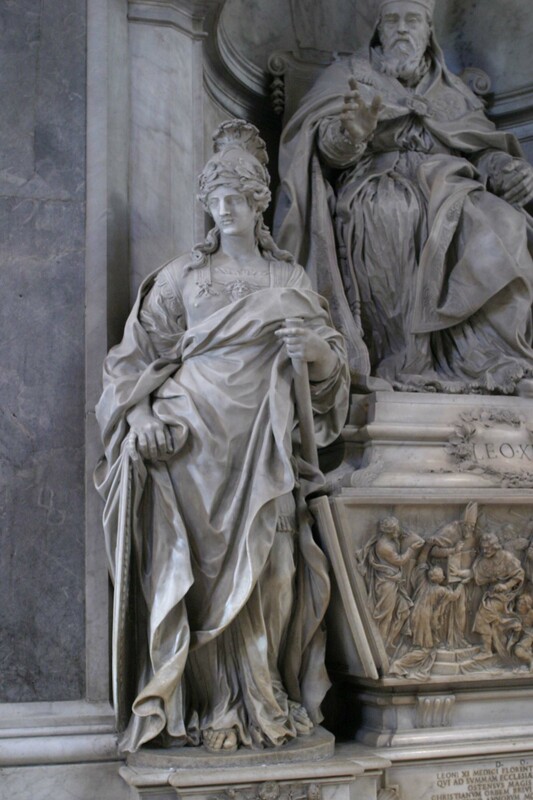 The two female statues, Fortitude by E. Ferrata and Generosity by G. Peroni, are certainly among the most convincing allegorical figures of all the funeral monuments in the Basilica. 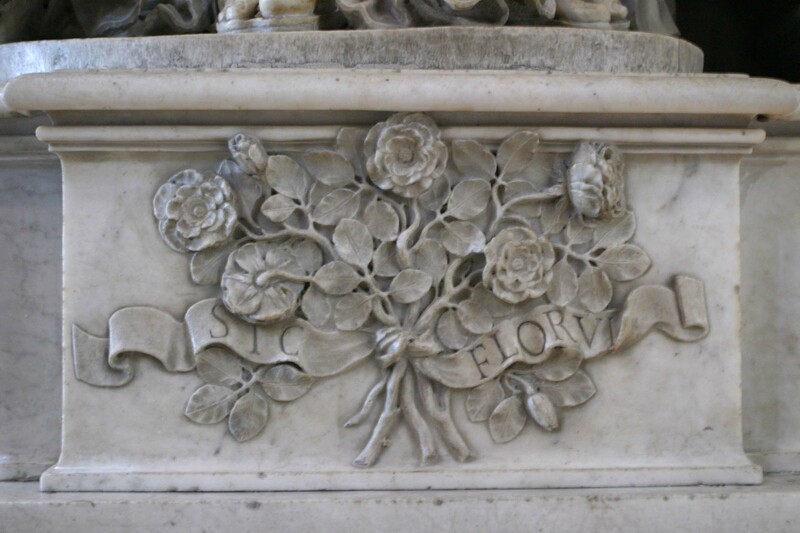 The wording "Sic florui" accompanying a bunch of roses at the base, is an allusion to the brevity of Leo XI's Papacy (only 27 days) even though as a cardinal he had had a leading role in the previously mentioned conversion of the king of France. 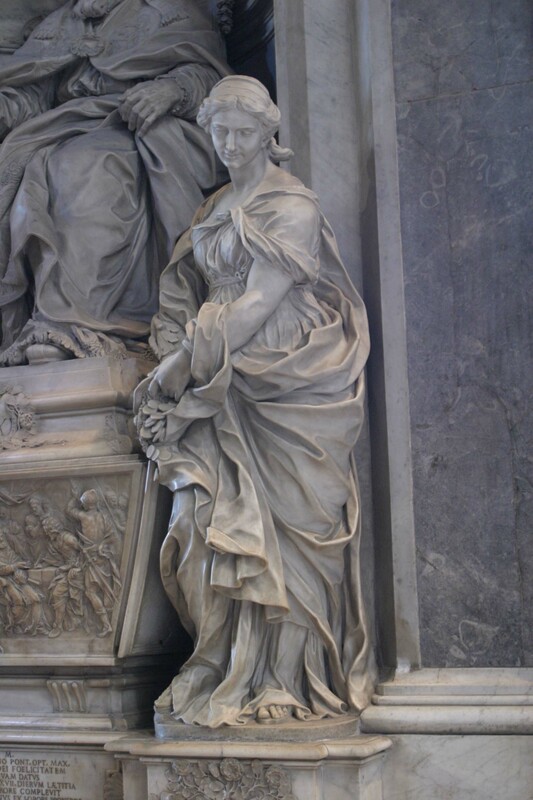 In the aisle to the right we note the tomb of Leo XI Medici, in white marble, by Alessandro Algardi (1645-1646). 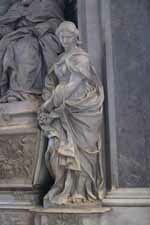 It is constructed after the model of the monument to Urban VIII but on a smaller scale. The Pope, with a gentle paternal expression, extends his hand toward the faithful; below are the figures of the Majesty of the Kingdom and Liberality, composed and austere. 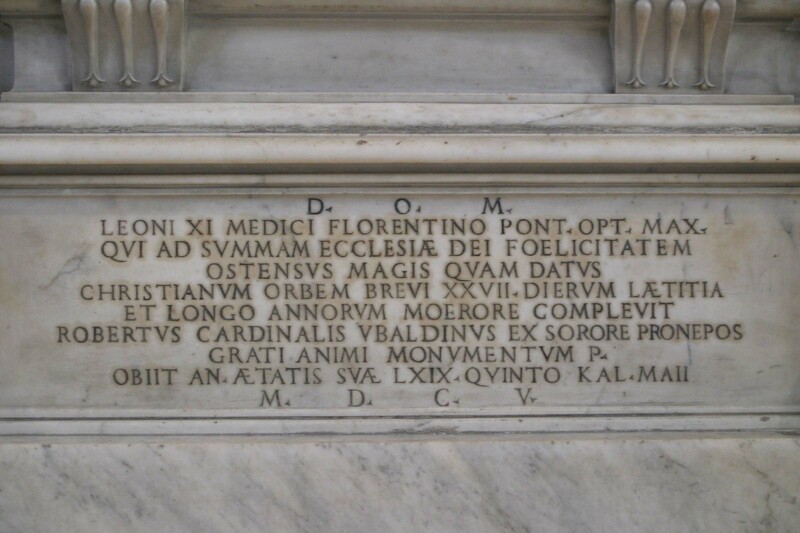 The epitaph reads: Ostensus magis quam datus, and the words sic florui are written on the lateral friezes; and indeed this Medici's blossoming was short-lived - 27 days as Pope - like that of the wilted roses that decorate the monument. The bas-relief commemorates the abjuration of Henry IV of France (1593) in the presence of Medici while he was Clement VIII's Legate. 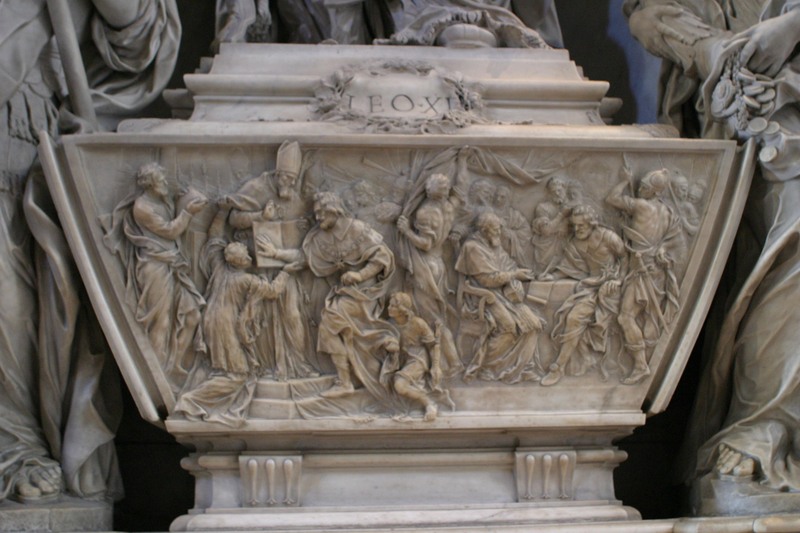 The tomb of Alessandro de' Medici, a member of a minor branch of the famous Florentine family, who was born in 1535 and reigned as pope for only twenty-seven days in 1605, was commissioned by his nephew Cardinal Roberto Ubaldini from Alessandro Algardi, who worked on it from 1634 to 1644. 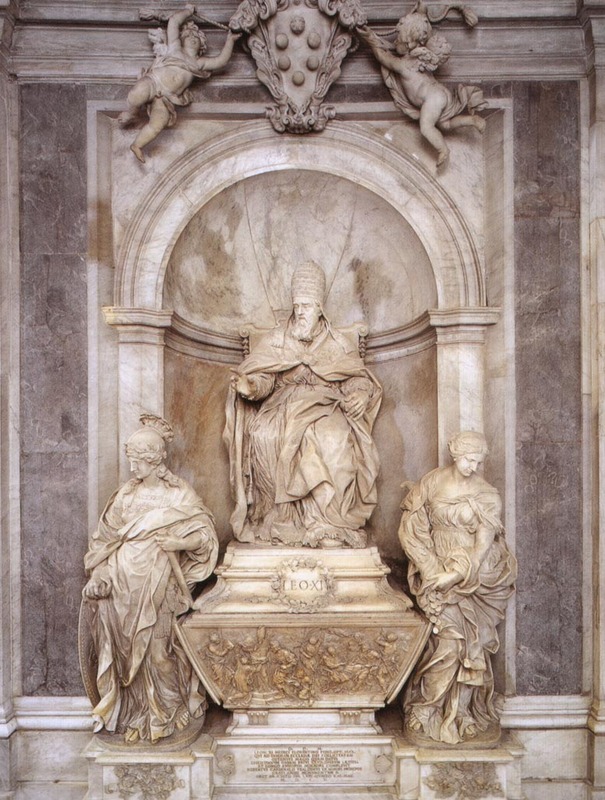 The statue of the pontiff is inside a niche, above a sarcophagus bearing a medallion with the dedication and a relief showing two episodes from the life of the pope. At the sides there are allegorical statues of Magnanimity (left) and Liberality (right), by Ercole Ferrata and Giuseppe Perone. 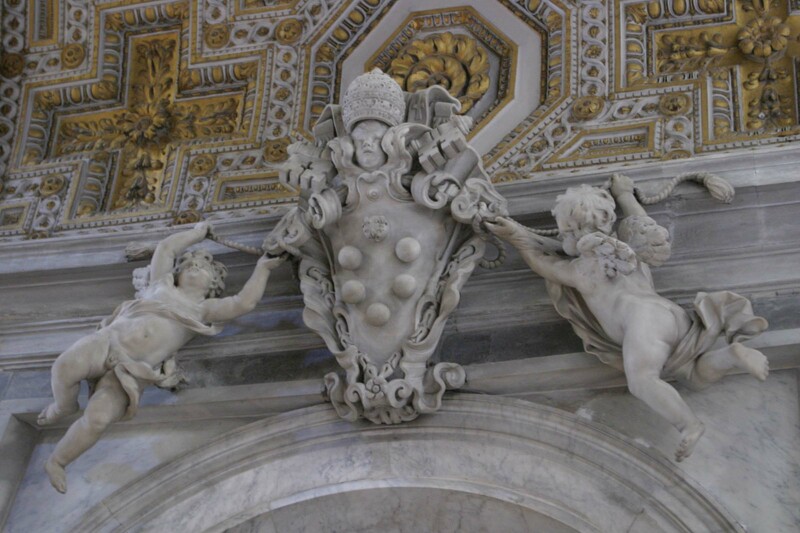 Above the niche, a pair of angels support Pope Leo's arms, as they attempt to fix it to the cornice with strings. On 21st July 1634 Cardinal Roberto Ubaldini, the pope's nephew, commissioned to Alessandro Algardi the monument on the right of the passage leading into the left-hand aisle. 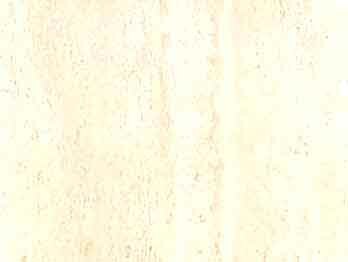 It was completed on 26th December 1644, but unveiled to the public only on 23rd June 1652. Leo XI was a member of the famous Medici family and a grandnephew of Leo X. But while Leo X was a thoroughgoing Renaissance prince, his grandnephew was a true Counterreformation pope. 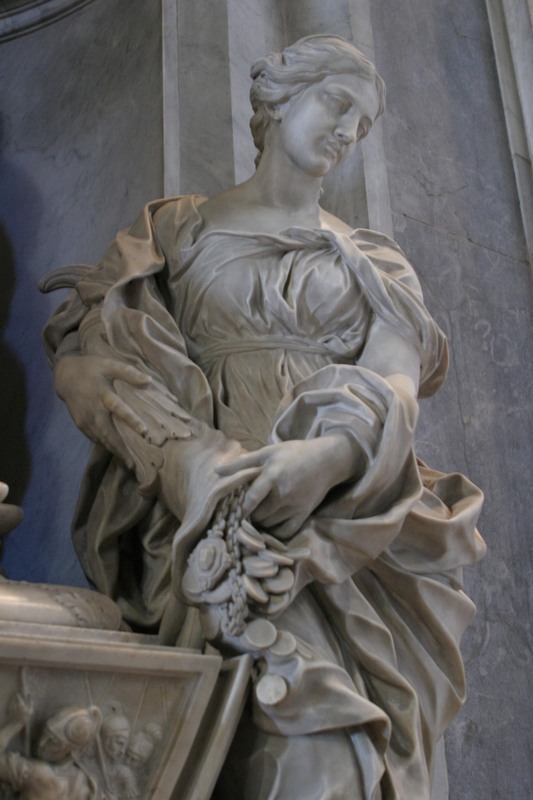 One typical Medici quality was shared by both, a love for literature and art. 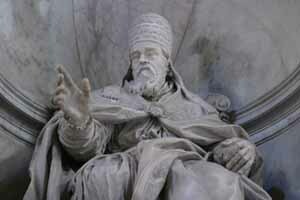 He was a close friend of St. Philip Neri, and active in introducing the Tridentine reforms. He helped to persuade Clement VIII to absolve Henry IV of France (1589-1610) from excommunication, being himself appointed legate in France in Apr. 1596. Easter Sunday, April 17, the coronation day of Leo, was a gala occasion for the Romans, but for Leo himself it was deadly. The old man caught a chill during the ceremonies and soon was in bed fighting vainly for his life. When it became evident that he was going to die, appeals rained on him to make a nephew a cardinal. Although the candidate was worthy, Leo had so great a horror for this rather common papal failing, that he repeatedly refused. Indeed when his confessor added his voice to the general pleading, Leo exchanged his confessor for another more prudent or detached.